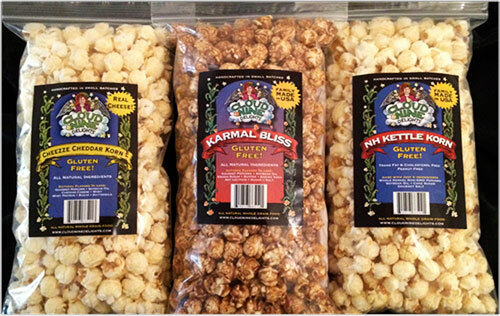 NH Kampin' Korn: This is a great popcorn package to bring on your next camping trip. It includes everything you need in one bag to make your next camping trip really pop and tell some scary stories at the campfire ! NH Kampin Korn: Everything you need to make great story telling popcorn over the campfire! Unfold the foil and lay flat. Place the corn and oil In the center of the foil. Bring the four corners of the foil above the corn and oil inside, leaving enough space for the corn to pop. making sure the packet is on securely. Set the packet in the hot coals until the oil sizzles and the first kernel pops. (don’t leave the packet in the fire)! Carefully raise the packet and shake it continuously until the popping slows. Then place to the side to cool. Contents and steam will be hot! Add salt. Live free and snack healthy! people of all ages can enjoy this new popcorn experience while camping and please remember that this popcorn should be made by an adult using caution.